Penny Parker, left, Dave Manning and Christen Milligan with three of the four horses Parker rescued. 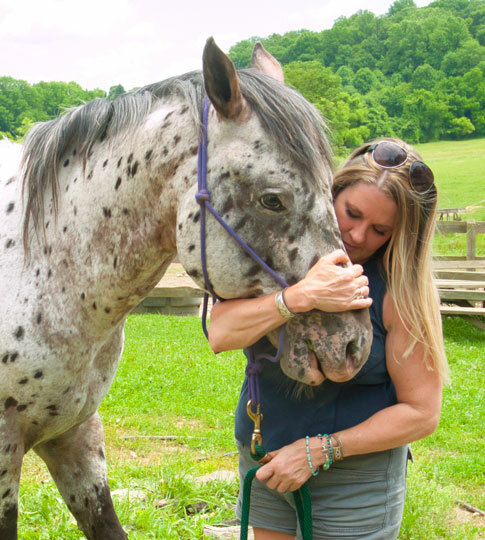 A Maryland woman was indicted in May on more than 60 counts of aggravated animal cruelty and of animal abuse and neglect after 98 horses were found in what was described as unlivable conditions in March. Another 20 to 25 carcasses were found on the Wicomico County farm. Reports said some of the horse were found breaking into the house looking for food. Other horses were too weak to move. The animals have since been rescued and four of them — Baron, Frankie, Dave and Eve — are currently being tended to at Thornbury Farm, courtesy of Penny Parker, the farm’s stable manager. Parker rescued one mare and three stallions. They were all undernourished, she said, and basically feral. They had sores all over their bodies and their hip and rib bones were showing. She said she found one of the stallions, named Baron, lying on the ground with his belly so distended Parker at first thought it was a pregnant mare about to give birth. Parker and her partner Dave Manning were able to get the four to the farm owned by Randell Spackman in Thornbury Township in early spring. 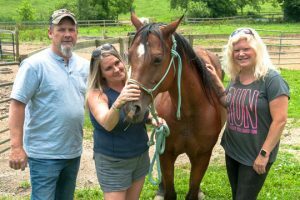 Parker and Manning, along with assistant manager Christen Milligan have been nurturing the horses back to health these past months and have managed to increase the horses’ weight by about 400 pounds each. But that’s not enough for their well-being and successful life, Parker explained. Penny Parker with Baron. She said she hopes to be able to keep him for herself. She said that’s to help prevent an excess population. “We don’t want the stallions making more babies,” she said. Manning said that was one of the things that led to the unlivable conditions at the Maryland farm. There were too many horses. In addition to the veterinary work, the horses also need to be trained and socialized before they can be put up for adoption. And the training is costly — $900 per month per horse and it could take months or longer, possibly as long as a year, Parker said. Dave Manning, Penny Parker and Christen Milligan with Eve, the one mare Parker rescued. Training includes socialization with people and other horses, becoming saddle broken so they can be ridden and to learn “ground manners.” Parker said that means they learn not to step on people, know when to stand still and how be calm when a farrier is working on them. She said those who want to adopt will first be interviewed and need to provide vet and farrier references and be willing to sign a contract specifying no resale of the horse. Parker said she would also need to see the barn and facilities. Farm owner Randell Spackman said he thinks it's "tremendous what Penny is doing. I support what she's doing. Animals in need of a home need to know some kindness." Also helping with the rescues are caretakers Carly S. Singer and Michael Czaplicki.